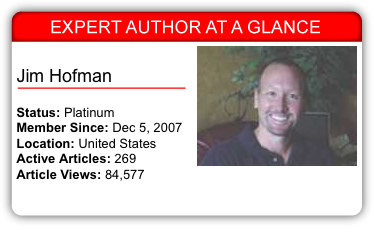 Today’s Expert Author Case Study introduces us to Expert Author Jim Hofman, owner of WineTrailsUSA.com and PresidentialTravelUSA.com. It’s a powerful link building opportunity. It generates more traffic and exposure to his content. It builds the reputation of his websites. Deciding what to write about is easy for Jim. He understands the typical dilemmas faced by travelers, and he uses his vast experience to find solutions to those dilemmas. These solutions become article ideas. Jim understands the real value of his knowledge. Instead of spending extra hours on perfecting each article, he thinks about the value of the information he’s providing. As a result, he’s more interested in getting the article completed than making each one perfect. As part of our ongoing Expert Author Case Study project, we asked Paul to share his thoughts on article writing and marketing. I think I have a lot in common with other Expert Authors. What I’ve seen is a dedicated, hardworking group that is passionate about their areas of expertise. I like to think I’m defined that way, too. My secret to article writing? Get over the need to be perfect. Obviously grammar, sentence structure, and flow are important. But frankly, I don’t angst too much over an article. Nor do I paint with too broad of a brush. I focus on a narrow aspect of the topic and try to provide useful information. I stay motivated to write articles because I trust they will bring value to my audience. In turn, I believe that trust will ultimately be rewarded with higher website traffic. For me, it is viewed as a long-term project. Deciding what to write about is easy for me. I ask myself “What would I like to know about this topic if I were visiting a website?” and come up with a list of 10-20 items. Those are my article topics. First, I write free form. Then I go back and review with a more critical eye. The key, for me, is that I don’t get too picky with myself. Is the information useful? Do I think people will find it useful? If the answer to those two questions is “yes,” the article gets submitted. I have one particularly established site, about three years old now, that remains on the first page of Google results. This is solely due to EzineArticles.com. Another much newer site is rapidly approaching the first page in a very competitive niche. This tells me something very simple: more quality articles = more quality traffic. Article marketing is my #1 marketing strategy. I always use it first, in between, and last. Why? Because it is proven to work. It builds links, gets my content out on the web, and builds the reputation of my websites. I believe the tools at EzineArticles are very underutilized. From a purely practical standpoint, I love the edit feature, it is fast and helps me as a writer. The Blog is a great source of ideas and information. The periodic emails from Marc are very useful. I devour each of them. If I had to start over, I would more quickly realize the obvious connection between quality articles and website traffic. Devoting time to write every day, or almost every day, is very important. Even if you only have an hour, you can write a very useful 400-500 word article. Resist the urge to be perfect. None of us are perfect; our articles won’t be either. Get in the habit of writing every day. The more you write, the easier it becomes. Always put yourself in the shoes of your readers. Ask yourself, “What would I like to know about this topic?” Then, write accordingly. Don’t be overwhelmed by the concept of quantity. Do what you can each day. Don’t doubt yourself. If you consistently submit articles, you’ll see an increase in website traffic. Don’t get sidetracked! It’s so easy to get seduced by the so-called “Latest and Greatest” push button traffic techniques. Article marketing is a proven winner. Yes, it takes work, but the bottom line is it DOES work. Incorporate these guidelines while writing your next set of high-quality, original articles and let us know how they work for you. Also, leave a comment for Jim. He’d love to hear from you. I believe this 79 year old greatgrand ma will need to incorporate Jim’s guidelines to reach her goal. Thanks for sharing the information, I have just started my journey on IM and have had my first six published. Traffic is obviously sort after and I have found I am going in circles! After reading your story I will continue to submit articles once EzineArticles approve my first ten and let me submit more! Thanks again. Good article Jim. The bullet points are pure gold. Obviously written by someone speaking from experience. I am printing this out right now and keeping it next to me while I am writing my next great article. Thanks for the insights, Jim. I have literally started article writing this week and am looking forward to the journey. Your points struck a positive chord. Thanks for the great and concise tips. I especially like the encouragement not to be stifled by perfection. I’m torn now between article writing for EzineArticles.com vs. for my own blog. I just don’t have the time for both. Can you comment on the comparison between the two? Is one more productive than the other? Do you also blog and if so how do your blogs and articles differ? Thanks! To answer your questions … if you’re strapped for time and only have “x” amount of time per day to write, an effective strategy is to divide it in half … spend 50% of your writing time crafting articles for EzineArticles and 50% writing content for your site. Ultimately, both are productive. But the content on your site is what will keep visitors coming back for more! The content for my sites tends to be longer than an article I submit to EzineArticles. Typically my EzineArticles articles are 400-500 words. Depending on the topic, content on my site can be longer. The trick is to write until you’ve covered your point (or topic) and then move on to the next writing challenge. I am just beginning and find your article to be of great help. I’m excited! I enjoyed hearing about your article marketing strategy. Can I ask a few questions? Do you post articles on any other ezine-type sites so that you get links from a variety of websites? Also, do you post the articles that are published here on EzineArticles on your own website as well? Hi Susan, yes I do use other article directories but not to the extent I use EzineArticles. EzineArticles is clearly the best and delivers the most quality traffic and believe me I have tested it! I mainly use other article directories to acquire a variety of links. Links pointing to your website from various sources is important. But remember, with the popularity of EzineArticles, your chances are much greater for a website author to find your article, publish it on their site, and voila! You have another link! Tremendous focused content and a game plan anyone can follow.I’m inspired as a new DOE member to start writing and submitting articles that inspire people. I will print off your article and display it in my office for my daily accountability tasks and directional list of to do’s. I enjoy writing and like you I just try to think of a subject and give the reader tips that will truly help them. Your expert advice inspires me to write more. Very interesting to read about your success. Great article Jim, it pulled me in right away and I could read without taking my breath…. exceptional for me! Congratulations on being the expert author of this case study, Jim. I’ve been writing for my blog; however, I haven’t submitted anything to EzineArticles yet. I really appreciate your guidelines and will save them for reference when writing. I am using EzineArticles.com since last 4 years, and can you please tell me how can be a Expert Author. I have just read your Expert Author Case Study, some good information there, well done, I will most definitely take your information on board, you are right about getting into the habbit if writing every day, that is a wee stumbling block for me, I try to concentrate too much on other traffic methods and over look the power of EzineArticles, I will have to implement that into my daily tasks. Thanks Jim for the tips, inspiration and sage advice. I have written 23 articles on practical neuroscience with the intention of reaching out and helping people live the life of their dreams with a minimum of stress. So far, these have been blogs. I will pick the best ten, and submit on ezine categories Relationships and Self Improvement. Sensible practical advice that can easily be applied. Many thanks – now I need to put into practice! I can’t agree more on your writing everyday point. I’ve just now gotten disciplined with my writing so that I devote a couple of hours a day to writing posts. Thank you so much Jim for sharing your experience with article writting. I have two problems when writing my EzineArticles. They seem to be always too long and I spend really a lot of time trying to perfect them. I will put your advice into practice! The great ideas! Your article taught me a lot, but I learnt a bit with immense value. Even I started submitting my first article to EzineArticles.com some time ago and I could then be expert. Today after having read your article I made up my mind to write an article per day continuously. I’ve heard all these points reiterated so many times in connection with writing articles but this particular combination of Jim’s style, simplicity and clarity have made me very hopeful that I too can publish successfully in ezine. All his points are well taken but his answers to Qs 4 & 5 are taped near my keyboard here so I can continue to be inspired and just Write! … my first, second and third EzineArticles in succession. thanks for your sharing. I’ve learned much on article writing skills. Learn from expertized to become expert forever. Your advise here has been very helpful in laying out the strategies step-by-step. Especially the one where you need to submit unique articles everytime.